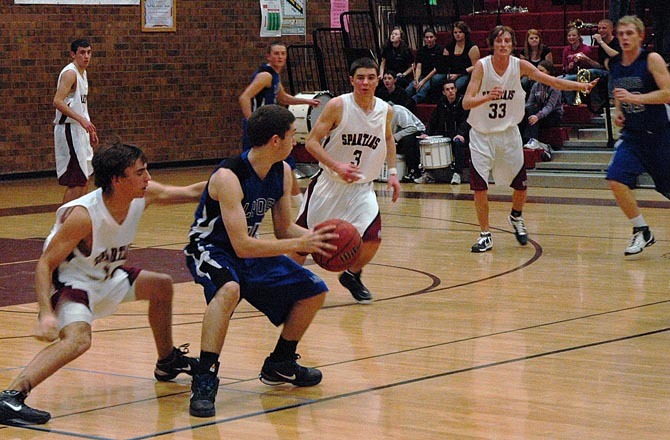 Friday night in the Berthoud High School gym the Berthoud boys basketball team won their third game of the season with a 64-45 victory over Lyons. The Spartans sank ten three pointers and went 16/16 from the free-throw line to notch their first victory against a 3A Patriot League opponent. Berthoud junior Greg Hutchins nailed six from beyond the arc and led all players in scoring with 22 on the night. “I just shot the ball and wasn’t afraid to shoot,” Hutchins said after the game and added, “I was a little worried because I missed a few early but coach told me don’t stop shooting until I tell you to stop shooting.” The coaching paid off as Hutchins sank four of his six three-point buckets in the second half as Lyons was closing the Spartan lead. Lyons mounted a small rally at the end of the first period to begin the second period down by only five, 12-7. The second period started well from Lyons’ perspective as well when five Berthoud shot attempts literally went in-and-out of the basket. Yet thanks to the first two of Hutchins’ six three-pointers as well as buckets from Ruebesam, junior Mic Nienaber and senior Cameron Botts, Berthoud took a 30-19 lead into the locker room at halftime. The lead could have been a lot larger for Berthoud had lady luck done her part. The third period was relatively sloppy by both sides but Hutchins, Ruebesam and junior Jesse Queen each contributed a three-pointer and the Spartans maintained their 11-point lead, 40-31. The Spartans took control of the game in the fourth period; Hutchins added another three from downtown and Spartans outscored Lyons 23-15. In addition to his game-high 22 points, Hutchins added five rebounds, two steals and three assists on the night. Ruebesam also had two steals and three assists to go with the 19 points he contributed to the Spartan victory. Santos lead Berthoud with five assists and his four steals tied him with Botts for the team high. The Spartans will play the Eaton Reds in Berthoud on Tuesday, January 18 before making the long trip up I-76 for a contest against Brush next Friday.